The club season is upon us; the offseason changes are complete and quest for the title has already begun. While this year is a little different due to the presence of the World Ultimate Club Championships in July, most of the road towards the trophy is well warn. Here’s the big picture view of what you need to know to be a responsible fan this season! San Francisco Fury returned to the top of the division last season, after a four year title drought. The championship made them the most successful American women’s club team in history, and it came in the city where they had won seven straight championships between 2006 and 2012: Sarasota, Florida. When the Triple Crown Tour began, and the location of Club Nationals left Sarasota, Fury’s reign of dominance ended. A one off return to the Championships’ old home and Fury reclaimed their place atop the sport. But now the Championships are on the move again, this year in San Diego, California. The west coast locale, on paper, should provide Fury with a home field advantage of sorts. But perhaps San Francisco is more at home in Sarasota. Can Fury win anywhere other than their Florida home-away-from-home? The roster is largely intact from last season, and they’re the favorites to win coming into the season. They do make a few major additions–headlined by superstar Sarah Griffith, formerly of Seattle Riot–and some key subtractions, most notably Claire Desmond. But the vast majority of the core that won the title last year is back. You could argue that the arrival of Opi Payne and resurgence of Alex Snyder had far more to do with Fury’s championship than the happenstance of Nationals returning to Sarasota. But their players seemed to buy into their being an important amount of familiarity and comfort from playing in Sarasota again. Fury proved in 2017 their championship window is still very open, and now they’re the team to beat. In fact, the women’s division has had repeat champions since Riot won in 2004 and 2005. For Fury to continue that trend, they’ll need to find a way to recreate their Sarasota successes in another city. How Big Is the Top Tier? The transition of Jenny Fey and Sandy Jorgensen to mixed ultimate caused quite an uproar in the offseason. While it certainly has thrown a bigger spotlight onto mixed, it’s also brought up a lot of questions in the women’s division. For years, Scandal, Molly Brown, Fury, Riot, and Brute Squad kept trading punches at tournaments, each pulling of a fair share of victories while suffering a number of defeats. It has been a while since Scandal was competing at the same level as they were when the team that won Nationals for two straight years, but Fey and Jorgensen ensured that they remained relevant. Now with Scandal facing a lot of uncertainty heading into the 2018 season, it’s worth asking whether there is a team that can challenge the top four. Unlike Scandal, Fury, Brute Squad, Riot, and Molly Brown have only become stronger in 2018 and consolidated power as they prepare for WUCCs. Is there a team that can realistically challenge these four? If so, which team is it? The obvious answer is Atlanta Ozone. Their victory over Riot at Nationals was the biggest surprise of the tournament and showed that Ozone was finally ready for the big stage. Adding the likes of Maddy Frey and Kristine Fedorenko is a great start in proving that they can retain local talent while building as a team. Unfortunately, there are still doubts about the Atlanta squad. Replicating their success in 2017 is no small task and Riot has proven multiple times that they don’t make the same mistake twice. Even more concerning is Ozone’s lack of success over the rest of the top four. Ozone will have to vanquish one of these other dynasties at least once more before they can be considered a powerhouse like Scandal was in the past. Especially in a WUCC year, there is a possibility that a Canadian team may rise from the pack and show enough team chemistry to take on the top four. Except Vancouver Traffic has lost a lot of talent from last year, including Ellen Au-Yeung, Rena Kawabata, and Ellie Hand. Toronto 6ixers has their own share of reasons why they probably will not crack the top four this year. The team is still very young and likely doesn’t have the experience to match the dynasty programs they must beat to be considered as a contender. There’s still a chance that these teams could put it all together in time for a run at the end of the 2018 season, but they’ll also face the same problem as the US teams going to Club Worlds: peaking twice in the same year. There are so many unknown variables heading into the bulk of the 2018 regular season. However, the continued dominance of Brute Squad, Fury, Riot, and Molly Brown is all but a given. It would take a lot for any team to make it past them again. There will definitely be a team that can challenge these programs eventually, but it just seems unlikely in 2018. How Will the World Ultimate Club Championships Impact the Club Season? There’s a boogeyman called “the double peak” that the intrepid US and Canadian teams headed to WUCCs have likely considered. How can a team plan to peak at just the right moment…twice? It probably doesn’t help that, of the three gold medalists from Lecco, only Drag’N Thrust reached the second peak; Revolver was unceremoniously sent off by GOAT in quarterfinals while Riot fell to Fury in the semifinals. While only one team won their division at both events in 2014, seven of the 12 semifinalists at Nationals attended Worlds. Its difficult to isolate the impact of WUCC’s on the Club Series, with their changing rosters, landscapes, and individual contexts. If anything, it forces attendees to pick up the pace with earlier and more advanced practices. “It forced us to start our season earlier and cover most of our strategic curriculum at an extremely accelerated pace, which has been both a blessing and a curse,” said Brute Squad coach Ariel Jackson. “I believe the tournament will yield the best prep for [the Triple Crown Tour] that we could ask for,” added Ozone captain Cate Woodhurst. Most of these teams are already expected to be top teams in the division, and if history is any indicator, it isn’t even close. They can all afford to have underwhelming US Open performances after a brief break following WUCCs. Club Worlds taxes teams’ time, sucking up PTO days and forcing tough decisions about how to use reps at practices. The trade-off for the advanced prep is clunky scheduling and some “musical chairs,” as Woodhurst put it, with lines at practices. The cumulative effect of these little cuts adds up during the season, but the extra prep and roster consistency for the top teams indicates most of the teams that go deep this July will do the same again in October. Sarah “Surge” Griffith has been a household Riot name for a long time. After many called her the best player in the world around the 2013 World Games campaign, she suffered an ACL tear in 2014. Griffith has returned to a top-of-the-list player, with back to back All-Club 1st Team selections. In her 10th year on Riot, Surge gets one final chance to top the Club Worlds’ podium while still in red and white. After that, she’s off to the Bay Area. After losing one of their most important defenders this year in Claire Desmond, Fury are fortunate to fill those minutes with another stalwart defender who, like Desmond, is a massive threat on offense as well. While Surge won’t exactly match Desmond’s size and athletic peak (maybe no one can), she’ll be an easy plug-in to a massively experience and talented team. Not to mention that, if Fury play Riot down the line, Griffith is spending the first half of this season getting daily reps against her future marks and defenders at Riot practices. That game, should it happen, adds a new wrinkle to the always must-see Fury vs. Riot matchups. There’s a disconnect between Frey’s impact and her regard. She’s bounced around rosters over the years, moving from Riot to a smattering of east coast teams and appearances on international rosters. Some may remember her from playing with Colombia Revolution at the US Open last year; she’s been playing with them at points over the past six years, while also making cameo appearances on other rosters. What you probably don’t remember is that Frey is a monster downfield. She led that Revolution team in goals during their remarkable US Open run and has proven herself a devastating goal scorer. Frey possesses impressive speed and impeccable timing. Having played in Atlanta for years, including during some stints with Ozone, she should be able to build chemistry, and add a downfield weapon next to Mira Walker, Emily Lloyd, and Kate Travaglini. Toronto 6ixers had a breakout season as a team in 2017. After missing Nationals in their inaugural campaign of 2016, they won the Canadian National Championship over long-time holders Vancouver Traffic, and then came within one point of making it to quarterfinals in their first ever USAU Nationals appearance. 6ixers are led by a core primarily made up of exciting youngsters brought up through the youth Toronto youth system and veterans of former club team Capitals. Lauren Kimura finds herself outside of both of those groups, but she fits right in with all of her teammates on the field. Kimura is a hugely influential member of the 6ixers attack, an ever-present option in the team’s backfield. She didn’t lead the team in assists last season, and she may not again this year, but she’ll likely lead the team in touches. Many of the teams moves flow through her, thanks to her ability to consistently get open for resets and her vast arsenal of throws. Look for Kimura to have an even bigger season in 2018. If 6ixers are able to improve upon their season a year ago, and make the break into quarters, Kimura will be a big reason why. It’s been two years since we’ve seen Johnston take the field. After spending time in the Peace Corps, there’s a well of curiosity built around what level of play she can bring to the field. The 2015 D-I Player of the Year in college was on her way to being a top tier talent in the club division as a key handler and defender for Scandal, landing third on their assist leaderboard at the 2015 Club Championships. Now, Johnston will find herself joining the second elite club team of her career as part of a six-person rookie class for Denver Molly Brown. While she’ll have some familiarity with some of her former All Star Ultimate Tour teammates, it might take a bit of time to figure things out with her new squad. 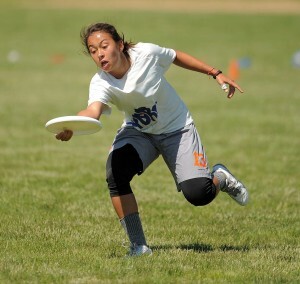 But once up to speed, the former Callahan winner should be a great fit in the Denver backfield, with the dynamism to drive an offense through break throws and aggressive cutting, which is what we’ve seen Molly Brown rely on in past seasons. The search for the next Scandal star is on, and Zhou may top the list. The Rutgers product made her mark in her 2016 rookie campaign as a tenacious defender. But in her sophomore season, she pushed up to 10 goals, good for tying for second on Scandal, at the Club Championships. Her athleticism and aggressiveness make her effective on offense, and as her game has gotten more polished, she’s put herself in better position to be an offensive focal point. It’s been discussed–and will continue to be–that Scandal has lots of touches and opportunity available for players to grab it. There are options for Scandal, but Zhou provides an explosiveness that many of her fellow cutters cannot match. With an opportunity to take on a larger load, the talent to back it up, and a trend in the right direction of increased involvement and importance, Zhou could prove a rising star in DC and buoy them when many might bet on them to sink. If there was ever a roster that could help San Francisco Fury win a non-Sarasota Nationals, this is it. Even a blow like the loss of Claire Desmond is softened by the addition of players like Kirstin Johnson, Amel Awadelkarim, Claire McKeever, and yes, Sarah Griffith. But we could exclude their impressive newcomers and Fury would still top this list as the most formidable team heading into the season. Their offense is rock solid and their defense is suffocating. Still, it’s always difficult to peak twice in a WUCC year. Fatigue could be just as great an opponent for Fury as the rest of the field. After two straight seasons as the best team in the division, Brute Squad was dethroned by Fury in 2017. Brute Squad, though, has hardly been removed from the top tier of the division’s hierarchy. After all, they held an 8-5 lead in the final, and ended up a point short of a three-peat. They boast a roster as strong as you’d expect, with additions like Alex Ode, Jessie Grignon Tomas, and Hannah Henkin to counteract the departures of Emily Baecher and Becca Ludford. Boston has a loaded team, with countless household names leading the way, but they also have a host of younger players on their way to joining their teammates in stardom. Former Dartmouth teammates Angela Zhu, Julianna Werffeli, and Caitlyn Lee have been bolstered by the likes of JoJo Emerson, Tulsa Douglas, and the newly added Henkin. 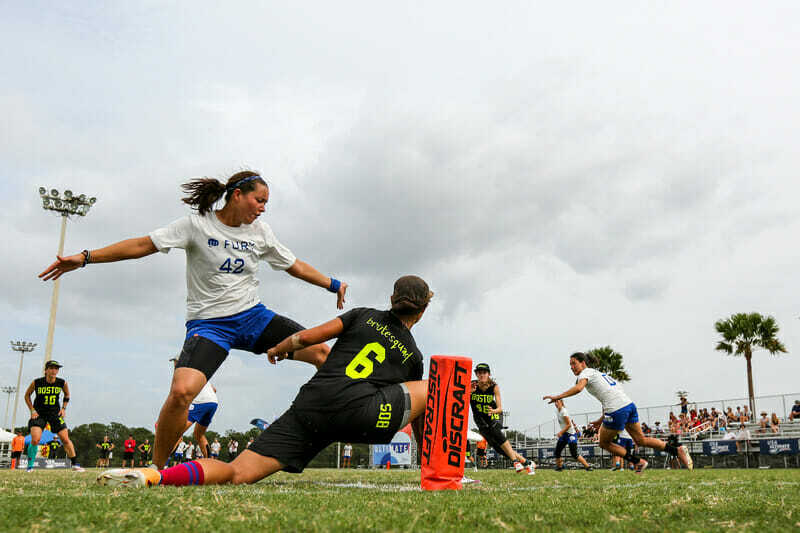 Zhu, in particular, has already demonstrated an ability to fill out an elite level stat sheet, and if they continue to increase their impact at the club level, than Brute Squad could very quickly return to being the best team in women’s ultimate. Last year, many jumped on the Molly Brown bandwagon as Claire Chastain dominated the spotlight. A ferocious offense and a smart defense brought Denver to the semifinals where they lost by just a couple of points against the defending champions. This year, the team maintains their top-end core, and replace their role player departures with a couple of really exciting names: Chelsea Twohig, a strong veteran; Alika Johnston, back from her two years off; and Alex Hardesty, a hard-nosed, grit-and-grind player who was central in Whitman’s recent College Championship final appearance. The return of Hannah Leathers is essentially gaining a new player, after a short and injury-laden 2017, and a full-ish season of Manuela Cardenas, a (potentially) healthy Megan Cousins, and more (this team had a ton of various injuries last season) makes this team extremely deep and potent. Molly Brown is upgrading in a meaningful way for the entire season, something not many of the other top-tier teams are doing at this level. This team is going to want to win one, if not both, of the big tournaments this season. Riot is in a new, quirky spot this season. 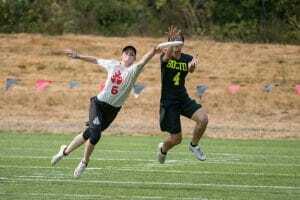 After being a couple of throws and catches away from a National Championship in 2016, the team suffered a shocking semifinal loss to Atlanta Ozone last season, and lost out on a chance to defend their WUCC title. But a couple of weeks later, Riot was invited to join the tournament after an inability to fill out teams from other countries. With several legacy players still on the team from the 2014 WUCC gold, and this new revived chance at the gold, combined with Sarah Griffith departing afterwards, Club Worlds should be a big target for this team. They bring back most of their players and add some really solid depth: Hannah Kreilkamp, Lindsey Wilson, and Molly Sinnott are strong Seattle names, and Sam Rodenburg from Schwa brings elite speed. Claire Trop, who has been on the path to become a Riot player for several years, is also joining for her rookie season, and has shown a lot of promise in her two recent championships with U24 US National Team and Dartmouth. If Riot can get over their years-long injury bug, they are poised to challenge deep into every tournament this season. They already defeated Fury 15-10 at Eugene Summer Solstice, a meaningful win in the first tournament of a Club Worlds year. Ozone was the biggest story of 2017. They stunned the entire division when they knocked off Riot in their quarterfinal last year to throw a wrinkle in the top four that had previously been believed to be untouchable. The question for Ozone now is if that win was a one-off, or if it was the beginning of a top five rather than a top four. They suffered the least attrition of any team that made Nationals last year, and added some exciting college players from across the Southeast, and veteran Maddy Frey as well. So the cupboards are full as they begin their march on the rest of the division’s elite. If they are to fully cement themselves among the best of the division, they’ll need to improve on their .500 record against the teams ranked below them in the top 11 last year, and more regularly hang with the already definitively elite teams. But their win over Riot in quarters, at the very least, proved that Ozone is capable of knocking off the top teams in a given game, and that in and of itself was an unforeseen development. Perhaps they’ll bring the fun again in 2018 and prove they are in the same league as Fury, Brute, Molly Brown, and Riot. It looks like 2018 could be a good year for San Francisco Nightlock, but they’ve been there, done that. Odds are that they are hoping to move from “good” to “great.” They’ve picked up a strong collection of solid players, but it’s still difficult to tell whether it’s enough to drastically move the needle for them. A returning Michela Meister is joined by the likes of Lexi Hasan, Maggie O’Connor, and Manisha Daryani, among others. It’s easy to say that Nightlock will improve with these additions, but we still haven’t seem the team outperform their seeding at TCT events in the past. By now they’ve cemented themselves as the 2nd best team in the Southwest. It’s safe to assume they’re not content with that status. They aren’t yet at a level where they could steal the crown from Fury, but they could make strides towards that in 2018, which should probably be their goal. Traffic is back for another year of consistent, high-level ultimate. Their system retains a lot of constants, but they are not without some personnel changes. Rena Kawabata and Ellen Au-Yeung, two players who logged a ton of points and touches in their tenure with Vancouver, are both out. This means there’s more food on the table for others to come and claim, like newcomer and 2018 U24 player Sophia Chan, or potentially young returners stepping up, like UBC’s Julia Zhang or Naomi Morcilla. Traffic will also get a new, rare opportunity to take the “best team in Canada” title back from the Toronto 6ixers, who defeated Vancouver at the 2017 CUC’s. The 6ixers have been rising fast the past couple of season, while Traffic has mostly stayed put with their quarter-finals quality. These two teams duking it out across potentially two different major tournaments is going to be one of the best showcases this year. Since the downfall of the Capitals, there has not been a Canadian team that has seriously challenged for the title at Nationals. The Toronto 6ixers are probably not there yet, either. But they are a young team that could make a splash in 2018 with a young core and very little roster turnover. Anouchka Beaudry, Sarak Bobak, and Lauren Kimura all return and will continue to light up the women’s division. If the 6ixers can cut down on mistakes, and let their youthful energy carry them through WUCCs and the regular season, the team could end the season much stronger and more capable than when they started. Until news of Surge’s swap broke, the story of this season was the changes to the Washington DC Scandal roster. Seven All-Club selections walked out the door with Jenny Fey and Sandy Jorgensen. Along with Kelly Hyland, Amel Awadelkarim, Amy Wickner, and others, nearly 50% of the team’s goals and assists are gone. Scandal defied expectations for years, one of the only outfits that could consistently challenge higher ranked teams, before settling down a bit in 2017. This might be the biggest hill they’ve had to climb yet. Fortunately for DC fans, they do bring in some quality club contributors in Lindsay Soo, Edith Teng, Danielle Byers, and the return of Kath Ratcliff. Jessie O’Connor, Amy Zhou, and Lisa Kowalski can expect role increases to their already sizable portions. But with so much different for this year’s Scandal team, this is the toughest team to project. After a promising ninth place showing in their first Nationals trip in 2016, Rival underwhelmed last year. They still made it to the season’s final tournament, but their only wins came in consolation play. They’re still a youthful squad, and the disappointing finish to their 2017 shouldn’t be seen as an indicator of the future just yet. They add 2016 Mixed Defensive Player of the Year, Nancy Haskell, to the ranks, as well as a few others with high level club experience, and that should help offset the losses of Hannah Henkin and a handful of role players. But Rival’s talented younger players, such as Sophia Knowles, will have to better find consistency if they are to show growth beyond the team’s first two years of existence. Knowles should be one for the whole division to watch, in fact, as she’s coming off the back of an impressive performance at U24 Worlds back in January. Knowles is the likeliest on the team’s roster to emerge as a true superstar, and if she does so, it would go a long way helping lead Rival to new heights. 2017 was a really solid year for Underground, but with 13 players departing this season, things are a bit up in the air. Katy Craley, Lindsey Wilson, Hannah Kreilkamp, Molly Sinnot, Carly Campana, Mia Greenwald, and others were big producers at Nationals, and they’re all out. But a strong collection of handlers returns, including Jess Spaulding, Nora Carr, Cate Roscoe, Tiffany Phan, and more, while the team also picks up USC Hellions standout Julia Johnson, Alyssa Kelly is back, and the new blood is capable. With Portland Schwa seeing a similar shake-up, Underground is in a strong position to compete well for a Nationals bid. Seattle had a pretty good tournament at Eugene Summer Solstice already this season, losing just one game in pool play, a one point loss to Nightlock, and another one point loss to Schwa in bracket play, but winning the rest of their games for a 5th place finish. The challenge for Madison Heist this season will be overcoming the loss of Georgia Bosscher, Mich Philips and, Sarah Anciaux. Bosscher’s absence is especially notable, as she has been one of the most reliable players on Heist’s roster for most of her ultimate career. With the departure of so many talented players, there is plenty of space for a new star to rise alongside Robyn Wiseman. Rose Glinka, Emily Langland, and Amelia Cuarenta will be asked to produce even more for Madison. Unfortunately, the odds aren’t good for them if no one steps up. With the emergence of Pop and other new contenders like Wild Rose, this may be the first time Heist could be in danger of losing their hold over the North Central. It took very little time for Portland Schwa to manage to surprise with a solid showing at Eugene Solstice to open their season. The team’s roster underwent significant turnover, potentially forcing Portland to take steps backwards in an effort to recover, particularly in such a competitive region and when they’ve been near the fringe of the Nationals scene for the past couple of years. But they beat both crosstown rival Underground and Winnipeg Fusion at Solstice, while putting up respectable showings against Fury, Nightlock, and Riot. Considering 47% of last year’s Nationals goals and 42% of assists came from players who aren’t on this year’s iteration of Schwa, those are impressive results. Replacing Tina Snodgrass, Ella Hansen, Kelly Hansen, Chelsea Twohig, and their other losses will be tough, but there is enough experience and talent to navigate the challenge successfully. Chicago surprised a lot of teams in 2017 with their undefeated run through the Elite-Select Challenge. Their success didn’t shine through at Nationals, winning just one game as the last seed at the tournament, but a statement was made. This year, the team loses several talented players in Julia Butterfield, Amanda Dobbyn, Dori Franklin, and Katie Dyer, but the roster is mostly the same, and head coaches Lindsey Hack and Katie Dolara Olsen are back. The team will compete at the U.S. Open, as well, and get top-tier playing-time against some strong competition, some of which will be trying to recover from Club Worlds. This tournament, as well as the rest of the regular season, is important as the regional rivalry continues to grow against Columbus Rival. Both teams are solid Nationals contenders, but Rival took the Great Lakes title last season, so a second bid would be useful. Showdown ended their year with a remarkably disappointing showing at Nationals. The Texas club ended the season ranked #11 in the Ultiworld Power Rankings, but finished dead last at Nationals. They also enter this season with a fair bit of uncertainty in who will lead the team. They’ve lost some of their most experienced players with Katie Forth, Julia Eagle Malacek, and Edith Teng all leaving the team. They also lost 51% of their assists from last year, the second highest mark out of the entire Nationals field. Still, there’s reason for optimism. Texas Melee has provided a consistent pipeline of talent for the club over the years, and players like Dre Esparza, Julia Schmaltz, Laura Gerencser, and Ivy Harrison should only continue to improve. They also plucked Bethani Eberhart and Katie Metzler, two of the top players from the Dallas-based Maeve to help fill out the roster. At the moment, Showdown is short on proven stars at this level. Sarah Levinn is the face of the team, and Bex Forth and Elise Bjork are two nice, experienced players. But whether or not Showdown improves on their disappointing conclusion to 2017 will come down to how much some of those less proven, younger players step up. After a very strong 2017, there’s reasons to get excited about another step forward for Minneapolis Pop. Cutters Biz Cook, Courtney Kiesow, and Jenny Gaynor are joined for the 2018 campaign by speedsters Becca Ludford and Rachel Johnson, which all adds up to a headache for the opposition. The challenge may come in finding the requisite throwing experience to take advantage of those downfield tools. Holly Denecour and Anna Reed were the team’s primary throwers last year and won’t be taking the field for Pop this season. The team will ask more of Chip Chang and Rebecca Enders, or pull Kiesow back more frequently, to compensate. Boston Siege fired the first volley into the strongholds of the Northeast by winning Boston Invite to start the 2018 season. With wins over BENT and Iris included in their 7-0 run through the tournament, the young program is laying the necessary path to get to their first Nationals. That accomplishment would be the culmination of a few seasons of scratching their way up the regional pecking order. While they lost Lizzie Jones, Margot Lieblich, and Hannah Walter, among others, Siege brought in experienced club contributors like Nikki Ross and Vicki Chen, as well as Katrina Meserve, one of the D-III season’s stars. The infusion of experience onto the young roster will push the ceiling higher for a team that has been steadily climbing already. After struggling through 2017, Wildfire seems to have embraced a youthful rebuild with their 2018 roster. This is not to say that Wildfire looks worse off this season. They’re bolstered by an influx of young talent includes Dena Elimelech and Mei Bruist, two players that built a name for themselves during their college careers. Wildfire will also benefit from adding a larger coaching staff, headed up by Dan Bellinger. It’s hard to tell right now what the ceiling may be for the SoCal women, but they have the pieces to make a run for Nationals. And since the tournament is coming to San Diego this year, it’s no question that this is their goal. The Northeast as a whole has continued to grow stronger, which has made it much harder for any single team to gain a foothold in the region–outside of Brute Squad, of course. While BENT has constantly seemed poised to emerge as a threat, in the past they’ve been stifled by heavy roster turnover. This year is no different. Despite now a stable coaching staff, BENT’s core continues to fluctuate. Promising new young pieces like Cidney Weng and Jessie Sun don’t make up for the loss of 14 players from last season1. As BENT has proven in the past, it’s tough to build a title contender when there’s so much turnover year-to-year. It’s not all doom and gloom for the New York team, though. BENT’s style has often favored athletic defense and a fluid offense. The type of style that seems well suited for their current roster. Their strong region may also help earn them more bites at the apple come postseason. Iris didn’t qualify for Nationals last year, not even opting to play in the Club Series after their one Triple Crown Tour event. It was quiet follow up to 2016’s success, when the team finished second in the Northeast and won a pair of games at Nationals after appearing at the US Open. 2018 is off to a solid start – quality wins at NY Warm Up and 5-2 at Boston Invite with losses to BENT and Siege – and the team is finding their way after star Jessie Grignon-Tomas joined Brute Squad. Her absence means more weight on handlers Marie Genest and Marie-Eve Beauchemin, as well as Corine Masse and Julie Landry. They’ll need to pick up some momentum in such a stocked region and find a way to get results to get back to Nationals. But perhaps the extra reps and experience of Club Worlds will give them a boost above some regional competition. Phoenix missed out Nationals in the 2017, the second time in four years. Major roster upheaval was too much for the club to overcome and they finished 19th in the final USAU rankings and couldn’t come close to stealing Ozone’s bid. They lose even more experience this year, with Lyra Olson, Rachel Johnson, and Lindsay Soo all leaving. Jessi Jones and Jenny Wei are the two proven stars, but they’ll need help from Ashley Powell, fresh off an impressive final season at NC State, and others if they are return to Nationals this season. They add Brandi Skanes, a defender of great acumen. But if Phoenix is too have an improved season, it will come largely as a result of the young players that made up the bulk of the roster last year stepping up their game a notch or two. We didn’t see much of Stella last year, who only played in USAU competition at Select Flight Invite, but the Canadian outfit is capable of making a run should they participate in the Club Series. Should that make that run, they’ll have to do it sans a large chunk of their previous roster, fostering a new rookie class. They’ll tackle this season without the likes of Corinne Dunwoody and Kaylee Sparks, so it won’t be easy. Veteran handler Hannah Dawson leads the way, with cutters Alicia Zhao and Marie-Christine Jacques also playing critical roles for Stella. They took a 13-11 loss to Iris at NY Warm Up, but won the rest of their games over local competition, so the ceiling here isn’t massive, but they could surprise late in the season if they elect to appear. In a WUCC’s year, Fusion has a unique spot to occupy in the club landscape. They aren’t a staple of USAU Nationals, but they are headed to Club Worlds. That may make an appearance in the Club Series less likely after duking it out in Cincinnati, but perhaps that will actually spur them into testing their mettle in the States. Fusion already traveled to face stiff American and Canadian competition at Solstice, where they struggled against the top teams, but recovered in their last two games to take down Oakland LOL 11-7 and play close with Underground. Karen Hatch has returned from a stint with Heist, and the team is stocked with U24 Canadian National team talent, including Sarah Norton. They’ll team up with Alex Kovacs and Carmen Lee to provide a lot of Fusion’s punch. We’ll have a better sense of what they can do after WUCCs. Oakland LOL is the Uncle Drew of women’s ultimate. Last season, a contingent of semi-retired players from the Bay Area joined together to form a team that could allow them to compete without having to sacrifice too much time for their club team. It worked for LOL, they finished the 2017 regular season in the top 20 teams in the division. This year, the team is obviously ready to take the program to new heights. LOL has already made it to quarters at Eugene Summer Solstice and is also competing at the Pro-Elite Challenge. The largest roadblock to their success is probably roster size. LOL is not a large team and longer tournaments against tougher competition could be to their detriment. Still, LOL was suprisingly close to earning a bid last season and is poised to make a run again this year. Since the inception of Kansas City Wicked, the team has always been just outside the tier of teams that were competing for Nationals bids. With each passing year, Wicked would close out their season on a high note before losing veteran talent in the offseason. Things could be different for Wicked this season. They return a lot of players who took a break from ultimate last season and have had great chemistry in their early season games. Grace Roth has returned to the team and joins Claire Frantz and McKenzie Geltz as the players that drive the offense forward. But it’s not just a few stars carrying the team this season. There have been real contributions from the full extent of their roster. With their top-heavy roster from previous years, Wicked would outperform against weaker competition but flame out against their peers. There’s enough potential on this Kansas roster to flip that narrative this year. Comments on "Club Season Mega-Preview 2018: Women’s Division"